Some of y’all might have caught this one. Some time ago, buy information pills a French DJ by the name of DJ Troubl put out a mixtape called A Journey Into Fresh Diggin: Quasimoto Meets Himself. Check that post for details. Anyway, after that was posted, somebody quietly removed the mix from the server, prompting a bunch of emails asking me where the mix went, and where one could get it. 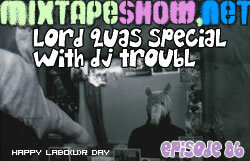 I just recently came across a CD with that mix on it, so with it being Labor Day and all, I figured I’d throw a nice long joint up for people to listen to while they drink lemonade or whatever it is you do on Labor Day. This joint is around 76 minutes long, so there’s plenty to get into here. 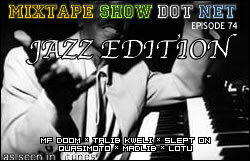 Funk, soul, jazz loops, Quasimoto (who is, for the uninitiated, the alter ego of Madlib), and just good music. Check it. More info available at rappcatts.com. Check after the jump for the full playlist and the full cover art in PDF form. NB: this playlist is copied directly from a kinda spastic message board post Troubl made himself around a year ago, so things might get kinda interesting with spelling and track IDs.